My aunt posted a link to this story on her Facebook Wall this last weekend. The Spoon Theory. Or – an analogy for explaining what it’s like to live with a chronic condition or disability. Per the reaction on my Wall after re-posting, it’s not a “new” theory. But it was new to me. In the article, the writer describes her daily battle with Lupus – another auto-immune disease. She describes her day-to-day regiment using silverware, explaining that every day, she only has a certain amount of spoons to get her through her tasks. Each time she chooses a task, such as waking up in the morning, she loses a spoon. When all the spoons are gone, her day is essentially shot, so it’s best to chose wisely. I choose spoons as well as a PWD. It’s a bit different dealing with a broken organ than say, a broken muscular system. I’m lucky that I don’t have major complications that would prevent me from getting out of bed in the morning. However, I do need to chose my spoons carefully, as I could pay for that choice tomorrow… or for three days straight… or for the rest of my life. Let say I also started with twelve spoons, as mentioned in the story. Let’s see. Yesterday, I started my day off with a lovely 234 mg/dl for no reason. (Other than I had yanked out my sensor the night before because it was misbehaving.) Good bye spoon #1. Why? Those morning blood sugars usually set a trend for the rest of the day. If I start of normal, I’m in a good mood. If I start off high, I have to wait for my corrections to kick in before I can eat, which skews my morning routine. This can cause delays in meals, and more importantly, coffee consumption. Speaking of coffee consumption, I’ve been extremely exhausted all week so I’ve been relying heavily on it’s power… and the odd things it can do to my blood sugars. #2 – gone. Let’s talk wardrobe. I wear a pump 24/7 and usually have a CGM installed. Wearing skirts, dresses, and pants without pockets usually takes considerable thought and effort in the morning, which I don’t want to deal with. And if I wear my pump clipped to myself, I’m no longer “invincible.” Don’t even get me started on shoes. #3 – gone. 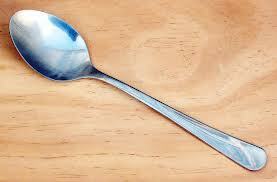 So – before I even walk out the door for work in the morning, I’ve lost 5 of my allotted spoons for the day. I’ve only been awake for 2.5 hours. Some days are not as dramatic and sometimes I can hold on to my spoons for longer to save for later. Other days – my spoons are gone in 6 hours and I might as well sit on the couch for the remainder of the day and say “fork this!” because nothing I do for the rest of my waking hours will make me feel better.